Not literally, because there was a pyrotechnic display on Saturday, during the symbolic reopening. But Stadium de Touluse seemingly hasn’t changed much. Well, seemingly. 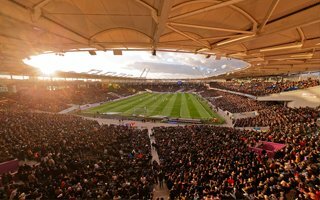 Saturday saw the official reopening ceremony of Stadium de Toulouse. The municipal stadium located in Îles du Ramier witnessed a somewhat sad inauguration. FC Toulouse is second last in the league and lost 0-1 against PSG on that day. but perhaps the least impressive part of the ceremony was the fact that Stadium de Toulouse wasn’t actually closed throughout the 2.5-year works. It all started quite impressively in early 2012. The fresh host city of Euro 2016 decided to expand the existing stadium to over 40,000 seats (see below). Building a new one seemed out of question after major redevelopment took place rather recently, in 1997. The 2012 vision would have cost the city over €68 million, later inflated to €71m+. But the city concluded that there’s actually no need for a stadium as big as the one proposed. Yes, Toulouse is France’s fourth largest city but neither the football, nor rugby players would attract as many fans for their games. The idea of adding upper ring throughout the stadium (currently only on the north side) was thus scrapped, while budget estimates went down to as low as €37 million in 2012. They did grow to over €41.5 million ($45m) by 2013, but it still allowed the city to deliver the cheapest stadium project of all Euro 2016 hosts. Works were divided into three major phases and despite construction lasting roughly 2.5 years (since mid-2013) there wasn’t much to look at. Almost all of the changes happened inside the stadium and they’re hardly spectacular. The single-tiered stands were rebuilt with significantly improved sightlines, but… almost identical appearance. Better layout, improved facilities and evacuation, slightly lower capacity (due mostly to new, wider seats of 75cm), HD lighting, media zone, hospitality and new turf (even if criticized after the Saturday game) – these are the changes that make “Little Wembley” into a top class stadium despite visually remaining almost unchanged. The city described it as a “human scale” upgrade, which seems to have been accepted by most media representatives covering the Saturday events.